This is the continuation of my series titled “Fundamentals for a Better Game.” The aim of this is to provide ball flight and impact fundamentals any player regardless of skill level can use to become better. In part 1 of this series we discussed Maximizing Distance, part 2 was Smash Factor and now, part 3 is Spin Rate. 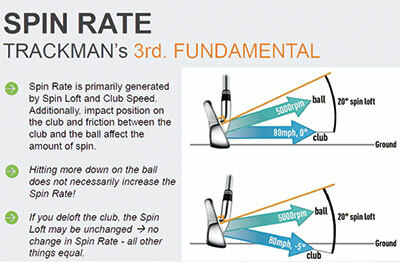 Spin Rate is something which at face value seems incredibly simple & straightforward. However, this is far from the case. The myths regarding Spin Rate go on forever. One being that hitting down at the ball more increases the spin rate. This ideal was levied from driver all the way down to chip shots. Another misconception is that balls have both backspin & sidespin. This is false. A ball spins & that spin is tilted on an axis. The most basic definition of Spin Rate is the revolutions per minute of the golf ball in flight. When a shot is struck, the ball starts spinning on an axis. That axis can be straight or it can be tilted (think airplane wings banking left or right). Really, a few things. One is that for the most part, a lower spin shot is ideal for drivers. The average player spins a driver entirely too much. Decreasing the Spin Rate for the average player could yield 15-30 yards, without question. Second is that the point of contact on the clubface can influence the Spin Rate greatly. Heel & Low on the face generates more Spin whereas High & Toe on the face generates less spin. Practicing Spin Rate is not really something you can do. However, you can practice that which either increase or decrease Spin Rates. For decreasing it (with driver, of course), keep track of where you contact the ball on the face. Look to strike it slightly on the toe & slightly above center. Also, work to strike up at the golf ball. To do this, you’ll want to put the ball off your left heel (assuming right handed) and swing out to right field. To increase Spin Rate (presumably) with a shorter wedge shot, you’ll want to introduce friction & bounce to the shot. Think of using the trailing edge to strike the turf first (not leading edge) so you take very little divot and nip the ball. Additionally, if you have a little sand on the clubface that always helps to increase friction and Spin Rate!